The 2019 Pension Answer Book covers the most recent legislative, regulatory, and case law developments so you're never without the information you need to detect compliance and regulatory issues - ensuring you make the right decisions and avoid potential problems. The 2019 Pension Answer Book is a library unto itself, probing, explicating, and elucidating the most recent laws, regulations, private rulings, and court decisions that affect retirement plans. The advantages of owning this reference source are apparent after the very first consultation. Don't deny yourself and your clients this valuable research tool. Exclusive Q & A Format! The 2019 Pension Answer Book is not only comprehensive in scope, but remarkably accessible, too. Clear, jargon-free language and an efficient question-and-answer format combine to speed your research every time. No wonder it's found on the desks of professionals and academics alike. 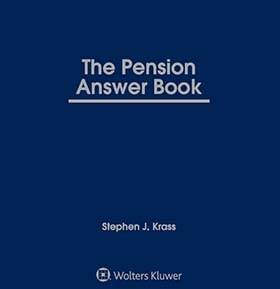 Renowned pension expert Stephen J. Krass provides rigorous updates that regularly re-establish this remarkable volume as the definitive work of its kind. No matter what type of defined benefit, defined contribution or combo plan you’re working with, The 2019 Pension Answer Book will give you the up-to-date, reliable answers you need. What is a pre-approved plan?